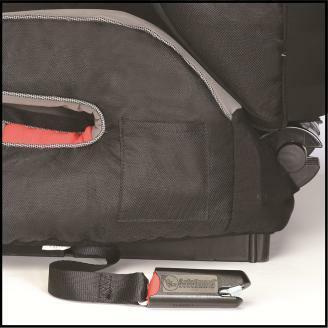 The Performance BOOSTER features premium push button LATCH connectors and convenient storage pockets. The RECARO Performance BOOSTER is a High Back Belt Positioning Booster Car Seat that offers intelligent design and quality construction for a safe and comfortable ride. It incorporates RECARO Side Impact Protection technology, inspired by four decades of racing seat safety, and holds children from 30 to 120 pounds. Kid-approved comfort features include CoolMesh air ventilation for breathability, side impact protection foam air cushions, luxurious fabrics with an extra-soft seat cushion, comfort enhancing memory foam, cup holders with removable liners for easy cleaning and stylish trim details. The Performance BOOSTER was designed with safety features such as flexible LATCH connectors to secure the booster to your vehicle, racing-inspired Side Impact Protection, energy absorbing EPS foam, a QuickLift, 11-position head restraint and color-coded belt guides. Tested to international standards, the RECARO Performance BOOSTER offers a racing-inspired design that protects a child during a side impact incident. The car seat's enhanced side wings are designed to protect each of five vulnerable areas of a child including their head, neck, face, torso and pelvis. With an upper weight capacity of up to 120 pounds, the Performance BOOSTER offers one of the highest child occupant weight capacities available of any high-back, belt-positioning booster seat. Assembled in the United States, the car seat meets all Federal Motor Vehicle Safety Standards for Child Restraint Systems (FMVSS 213) and Flammability of Interior Materials (FMVSS 302). For no-fuss care and maintenance, the Performance BOOSTER car seat comes in a variety of easy-to-clean fabrics and colors. The luxurious, temperature balancing fabrics offer superior comfort and have a stylish design. The CoolMesh Air Ventilation provides an air circulation system that will keep your child cool and comfortable during a ride. Featuring an ergonomic shell structure that offers support for your child’s body, the car seat is kid-approved for short errands or long road trips. The Performance BOOSTER features naturally contouring memory foam to make life more comfortable for your child. The car seat and head restraint are lined with expanded polystyrene foam (EPS) that absorbs external forces while providing your child ample protection and room for growth. To accommodate your growing child, an easy to adjust lever allows for quick and proper head restraint placement. 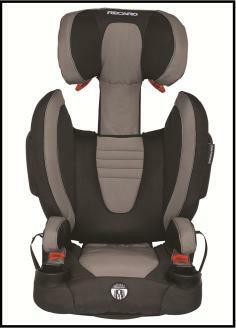 Eleven head restraint positions ensure proper positioning of the child for optimized safety and comfort. The user-friendly belt guides are color coded to help you secure your child properly using your vehicle's safety belts. Designed with push-button lower anchor attachments for added safety, the Performance BOOSTER is easy to secure to your vehicle. The flexible LATCH connectors anchor the seat to your vehicle preventing it from becoming a projectile when not in use. The car seat offers convenient storage pockets to keep the LATCH connectors neatly stored out of the way when not in use.